Jordan Spear is one of the lucky snow-sport aficionados whose parents got him started with skiing when he was just 2 years old. Born and raised in Sodus Point, N.Y., he learned to ski at the Brantling Ski Slopes, a small ski hill in Sodus where his father was the general manager (and is now the owner/operator). Jordan attended Sodus High School, knowing that after graduation, “I wanted to go to school for resort/hospitality/recreation management,” he told The Mountain Times. 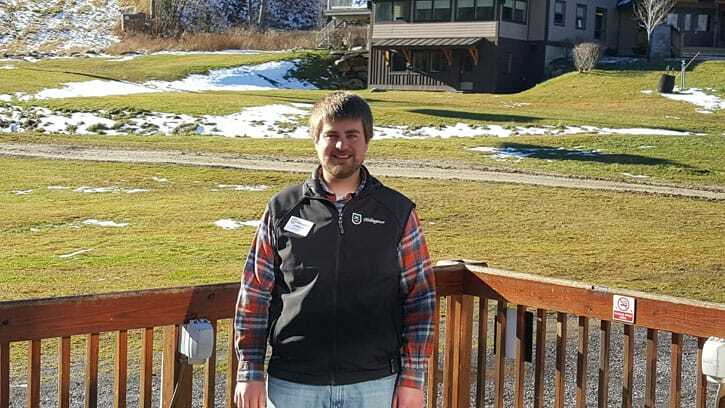 Ultimately deciding to focus on ski-resort management, he learned about Green Mountain College and Lyndon State College from web searches and applied. Mountain Times: Why did you choose GMC? Jordan Spear: I chose Green Mountain College because of the partnership between the school and resort. Being able to graduate in just three years with real work experience was extremely intriguing. MT: What came after your GMC/KSRM graduation? JS: After graduating from GMC in 2009, I returned home for the summer but moved back to Killington permanently that fall after being offered a year-round position as guest services manager. Some of my duties included managing the day-to-day operations of the guest service desks and bag checks; working with managers on guest problem resolution; working with departments to provide guest feedback on their areas for improvement; and reviewing promotions, new products and services, etc. to prevent guest service issues from arising from their launch. After several years in that role I was given the opportunity to manage the tickets and the season pass department, which is my current role as well as overseeing the Ambassador Program, and the Pico Sports Center. MT: What are some of your duties relating to the Ambassador Program and Sports Center? JS: I have two strong managers of each of these areas (Grizz for the Ambassadors and Rebecca Greenley at the Pico Sports Center). In general, I’m providing overall support and guidance to these individuals who truly manage the day-to-day operations of their areas. In the Ambassador area, I’m learning from Grizz on management of volunteers vs. employees as they require different leadership styles. JS: I enjoy the variety of my work the most. Each of the departments I manage is unique which ensures no two days at work are the same. I get a good mix of working with guests, leading staff, developing products and promotions, and managing our point-of-sale system. MT: How did your education prepare you for your current position? JS: The resort management curriculum offered a good mix between hospitality, leadership, and ELA (environmental liberal arts) classes. The hospitality and co-op classes gave me the opportunity to develop the “hard skills” I need to keep my areas operating on a day-to-day basis. The leadership and ELA classes developed the “soft skills” I use to keep my areas running well and constantly improving. MT: How do you like the mountain lifestyle? JS: The active yet relaxed mountain lifestyle suits me very well. Being able to snowboard, hike, and mountain bike all in my backyard is what makes living in Killington so much fun. MT: Do you have any advice for someone considering college and the KSRM program? JS: Do what you like and success will follow. For someone thinking of KSRM, it’s a pretty focused program so they should make sure that this is the industry they want to be in. It’s a ton of fun with a good mix of hard work, but it’s not for everyone.